Winter is all about weekend comfort foods that make the house smell great as they’re cooking away. This Best Ever Dutch Oven Braised Pot Roast Dinner with Potatoes & Carrots is a family favorite that doesn’t disappoint on flavor OR aroma! There is nothing quite like bringing the family around the SundaySupper dinner table with something comforting and delicious. 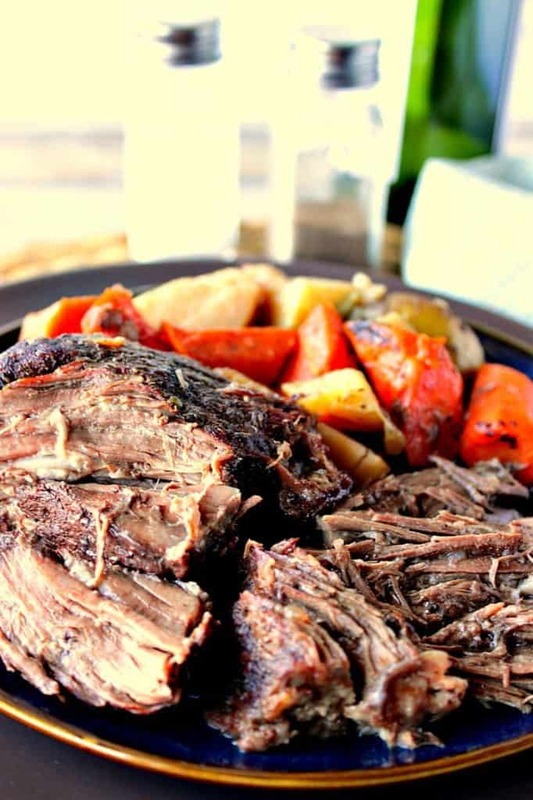 **Please Note – The printable recipe card with detailed instructions, complete ingredient measurements, and nutritional information for making Braised Pot Roast is available near the end of this post. What is the benefit of braising meat? Braising an inexpensive cut of protein like a chuck roast will turn even the toughest cut of meat moist and tender! Since this Oven Braised Pot Roast cooks in a low 300-degree oven for four to five hours (the longer, the better), the meat will be incredibly fork tender and will melt like butter in your mouth. A Dutch oven is, it’s merely a large, heavy pot with a lid. You can find many forms of Dutch ovens in the marketplace. Some are quite expensive but there are also many very reasonably priced options that fit every budget. In a large Dutch oven, sear the roast on both sides in the oil over medium/high heat. In the drippings in the pan, add a chopped onion and bay leaves. Add the chopped bell pepper to the pot along with red wine and the beef stock or broth. Add the seared beef back into the pot and cover. Place the Dutch oven in a preheated 300-degree oven for 3½ – 4 hours. Add 1½ pound of baby gold Yukon potatoes that have been halved and quartered, and 4 -5 peeled and roughly chopped carrots to the pot along with additional salt and pepper. Return the lid to the pot and place the Dutch oven back into the oven for an additional 60 minutes. To serve, scoop the potatoes and carrots into a bowl using a slotted spoon. Transfer the pot roast out onto a large serving platter. Spoon the beef juice over the top of the meat. Put away the knife and enjoy!! I received my Dutch oven as a gift from my eldest son for my birthday several years ago. I love, love, love using it, and would challenge those much higher priced, swanky French brand named pieces (I think you know the ones), to beat it. **The following affiliate links are some suggested products I’ve chosen that will aid you in the making and serving of this recipe for Oven Braised Pot Roast if needed. By clicking on the item photo, you’ll be taken directly to Amazon.com if you’re interested in purchasing any of these products. You are in no way required to do so, and you will not be charged in any way unless you decide to purchase one of these products through Amazon.com. As an Amazon Associate, I earn from qualifying purchases. 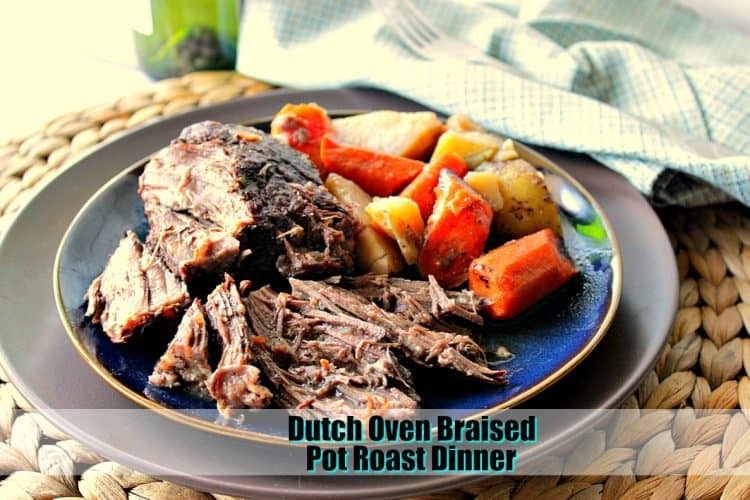 Below is the printable recipe card for today’s Dutch Oven Braised Pot Roast. This Best Ever Dutch Oven Braised Pot Roast Dinner with Potatoes & Carrots is a family favorite that doesn't disappoint on flavor OR aroma! Heat the oil in a large Dutch oven over medium/high heat. Season the chuck roast with 1½ teaspoon salt and ½ teaspoon pepper and sear it well on both sides. Remove the roast to a plate. Reduce the heat under the Dutch oven to medium-low. Add the onion, green pepper, bay leaves, wine, and beef stock or broth to the pot. Return the chuck roast to the pot. Cover the Dutch oven and place in a preheated oven for 3½ - 4 hours. Remove the pot from the oven, and add the potatoes and carrots. Season with remaining salt and pepper. Place the lid back on the pot and return to the oven for an additional 60 minutes, or until the potatoes and carrots are fork tender. Use a slotted spoon to place the meat and vegetables on a serving platter. Spoon the pan juices over top of the pot roast and vegetables, and serve hot. I sincerely hope you’ve enjoyed today’s recipe for Dutch Oven Braised Pot Roast for #SundaySupper as much as I’ve enjoyed bringing it to you. Eating with the family gathered around the dinner table is one of my greatest joys. If it’s yours too, and you’re committed to carrying on the tradition for years to come, please head over to the #SundaySupper website and take the #SundaySupper pledge HERE, along with me. To visit all the other #SundaySupper recipes for this week, please click on the titles below to be taken directly to all the recipes, and food blogger’s sites you’re interested in. **The post above includes affiliate links. When I find a great product or service, I like to share it with my readers. Sometimes I use affiliate links so I can earn a small commission for my recommendations. As always, I thank you for your support! This is such an awesome, comforting, but nutritious recipe. I love that you used the Dutch oven instead of a slow cooker too. I love using the Dutch oven in the winter months. The smells in the house are a bonus! I just love a good pot roast and your beef is cooked to perfection!!! Perfect for a Sunday supper! Mmmmmmm, pot roast is one of my family’s favorites! Here, too! Can’t beat it as a family pleaser! Classic comfort food and one of my family’s all-time favorite dishes! Looks like a perfect meal to me! I truly LOVE my Dutch oven too! You can never go wrong with a good pot roast. Looks so tender and perfect for a Sunday supper. Pot roast is such a great dish and so comforting! This is such a comfort food perfect for this cold weather. I’ll bet your kitchen smelled fantastic! That meat is fall apart tender! That’s part of the fun of a braised meal. The house did smell incredible! love this fall apart tender meat! This is the quintessential comfort food dinner! That meat looks so tender I can practically taste it from the photos. I love love love the smell of a roast cooking in my Le Creuset dutch oven. It’s divine. Red wine and beef broth and all the seasonings make this such a perfect winter comfort food! Thank you, Sara! There really is no better smell on a winter weekend. I love cooking meals in my Dutch Oven! 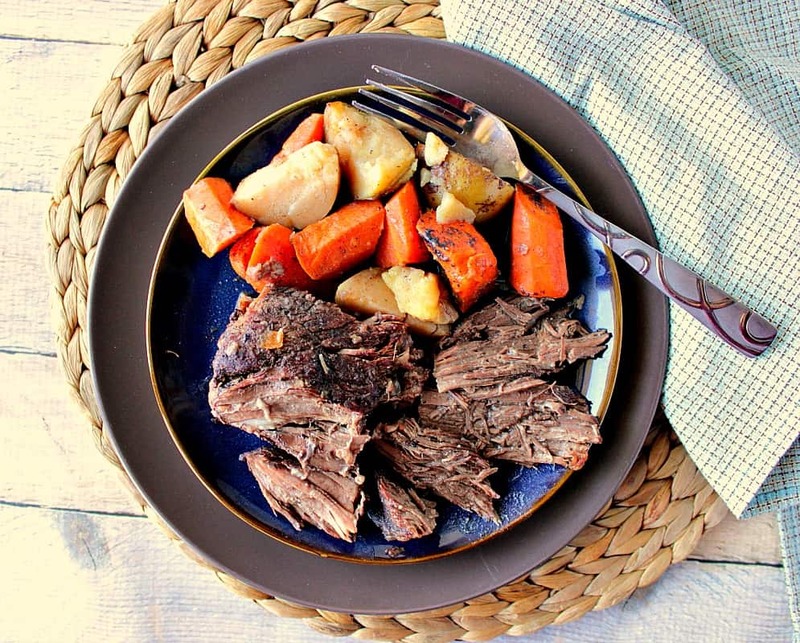 Usually I make our favorite short ribs, but now I’m salivating over this delicious pot roast. It’s so great when the whole meal is ready when you pull it out of the oven. Perfect dinner for these cold days of winter. I agree with you 100%, Linda! Thanks for stopping by!